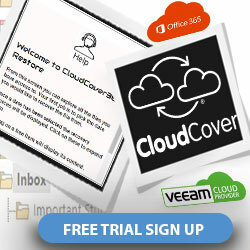 In the event of a disaster, utilising Veeam Cloud Connect ensures that data can be accessible again within a matter of minutes. 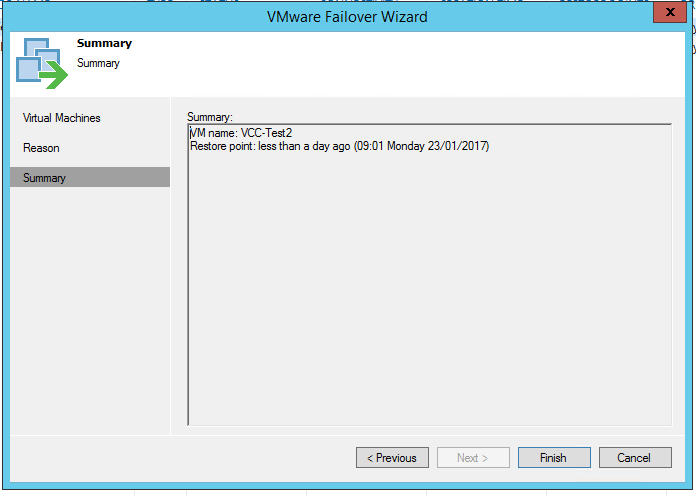 When a customer replicates to our platform they have two options for failing over VMs, these are full or partial failovers. 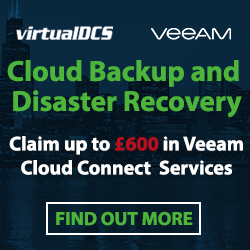 What’s the difference between full and partial failovers with Veeam Cloud Connect? Customers will only perform a full site failover if a customer’s platform has been destroyed and they require all the VMs failing over. 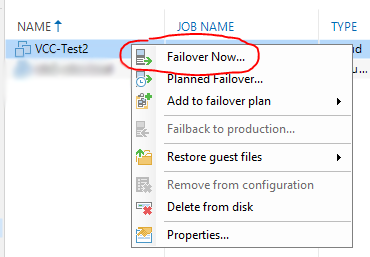 They will failover via a ‘Failover Plan’, which should have been created and tested previously. 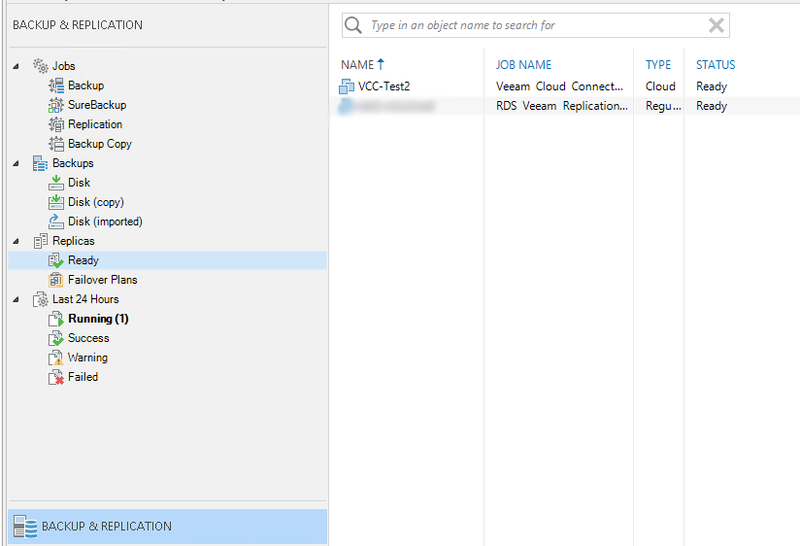 This guide is a walk through on how to perform a partial failover of a VM within the Veeam Backup & Replication Console. First of all, if you haven’t already, you need to create a replication job. 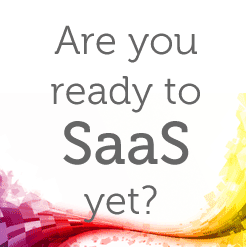 Point it towards your ‘Hardware Plan’ / Cloud host and ensure it finishes successfully. Now, the best way to test the functionality of the ‘Partial Failover’ is to ensure another machine on the source network can ping the VM on the LAN IP address once failed over. This will ensure the VPN connection to the ‘Service Provider’ side is working successfully. Here it is pinging successfully on the LAN before any failover has taken place. You can also see the tracert is going directly to the target, as you’d expect on the LAN, pay attention to the change following the failover. Backup & Replication > Replicas > Ready > Ensure ‘Replica’ status is set to ready. 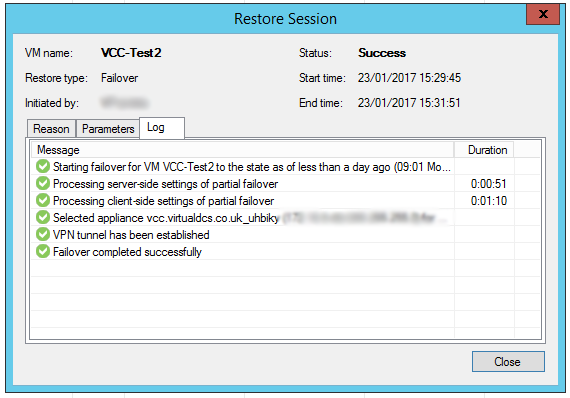 We can now begin the ‘Partial Failover’ within the Veeam console. 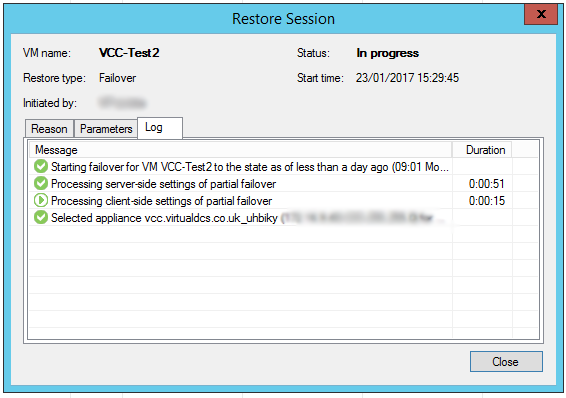 Now within the failover wizard, the customer can choose which restore point they would like to failover to (usually the most recent). Once selected, they can input a restore reason, this is optional. 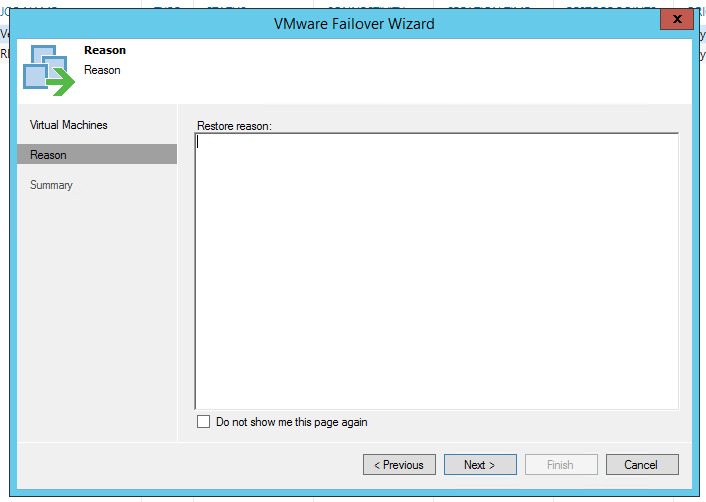 We can now select ‘Finish’ and begin the partial failover process. Now the log will appear, summarising what steps are currently being implemented. 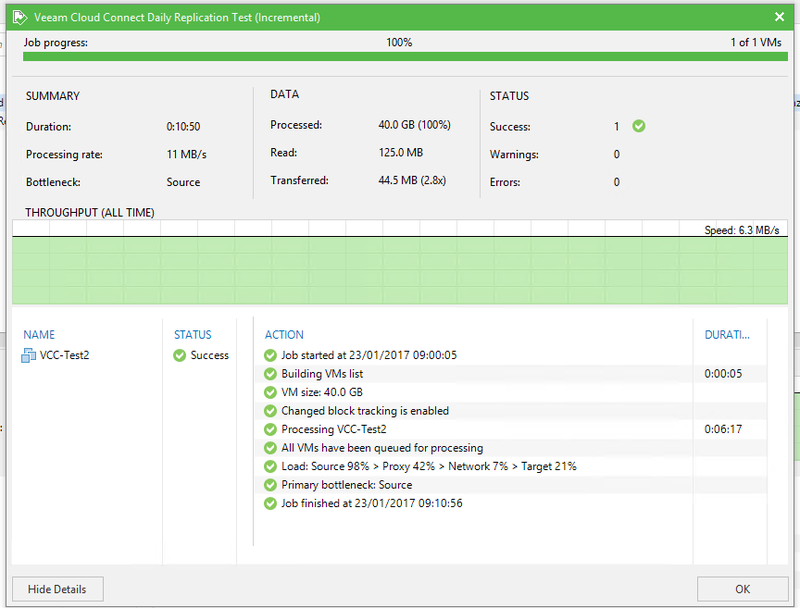 This part of the process can take several minutes, but it will keep you informed of when the failover has successfully completed. Following several minutes, you should see the VPN tunnel successfully establish. 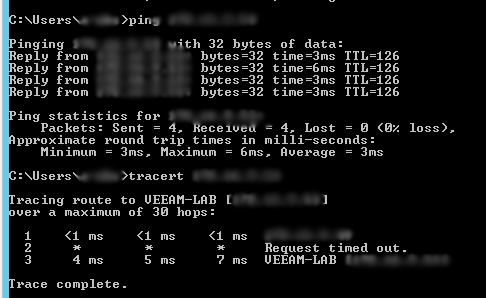 Once we see this, we can try to ping the VM once again and we should see some pings! 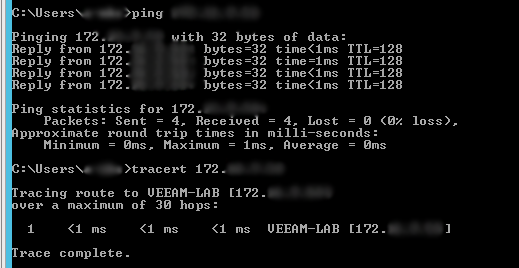 As you can see, the VM is now pinging and there is a slight difference to with the tracert from earlier. You can now see it is taking an additional ‘hop’ through the IP of the NEA. You should now find the VM is available on the network as if it was powered on in the live environment. You can RDP, browse to the network shares etc. The VM however is powered on in the failover site and being accessed via the VPN connection between the tenant and Service Provider network extension appliances.